There is reason to celebrate in the USA’s capital city after the Washington Capitals huge Game 4 victory in the Stanley Cup Final. The win left the Caps just one win away from a franchise first Stanley Cup, one that has eluded the regular season juggernaut of recent years. Even when things got a bit testy towards the end of the game, you would not have been able to wipe the smile off of the Capital One Arena contingent if you tried. The Caps were up 5-2 with just over two minutes to go in the 3rd period when TJ Oshie took a highly questionable hit from Vegas Golden Knights defenceman Brayden McNabb. This obviously was the beginning of a big kerfuffle that led to 32 penalty minutes being dished out before the next puck was dropped. 10 of those minutes went to Oshie via a misconduct penalty, which could be seen as unfair seeing as he didn’t really do much other than take a bad hit and then understandably want to have a word with McNabb about it. It likely wasn’t done out of what was deserved or not, however. It was done out of tempering what could have turned into something much larger. For the zebras, it was a safer bet to just make sure that Oshie wasn’t going to go head hunting by getting him out of the already basically decided game. When the penalty rundown was announced and the fans heard their favourite American forward’s name called, they decided to show him a little love with an Oshie chant as he left the ice. Oshie was right at the centre of everything on Monday night, but when the dust settled it was all of Washington that was celebrating. 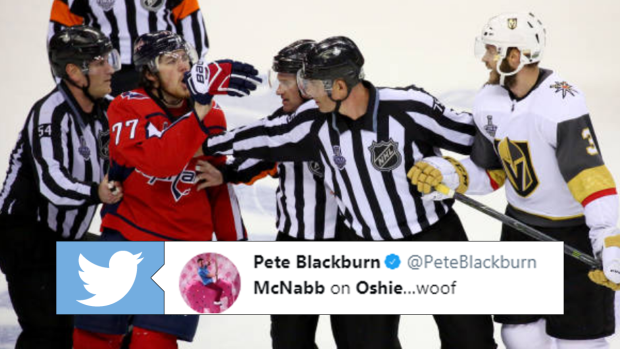 The best revenge from Oshie on McNabb wouldn’t be a head hunt, after all, it would sinking that final nail into the coffin and securing a Stanley Cup.